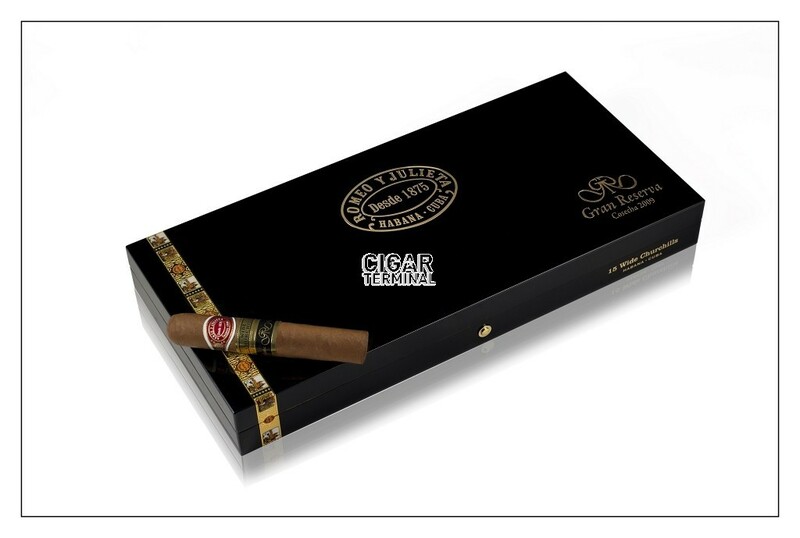 The Romeo y Julieta Wide Churchills Gran Reserva Cosecha 2009 is an exclusive Habano, with 55 ring gauge, 5.1” (130mm) long, and comes in boxes of 15 cigars. Presented in 2015 at the Habanos Festival, it was only released in 2017 and it is finally available for sale. 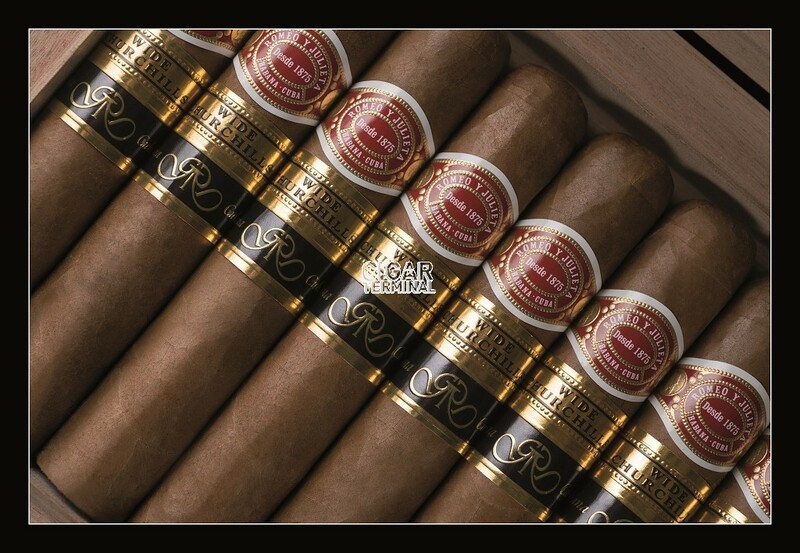 As it is a Gran Reserva release, the Romeo y Julieta Wide Churchill 2009 carries a third black band with the golden “G” and “R” letters. This band is in addition of the usual Romeo y Julieta band and the regular Wide Churchill band. The Wide Churchill Gran Reserva looks beautiful, the triple cap appears perfectly applied. Its wrapper is smooth, not veinless, but the veins are small enough that it is insignificant. The wrapper has a nice dark brown color, caramel-like, a colorado Maduro, which is a tell-tale that the tobacco is vintage (harvested in 2009). There are no soft spots, it filled evenly from the head to the foot; the construction is top notch. The wrapper has some savory flavors, while the foot smells of earth. The prelight draw is beautiful and very smooth. The Wide Churchill Gran Reserva Cosecha starts with some creamy earth then turns to more woody flavors. There is a bit of pepper, but it remains in the background. The body is at a medium level and the overall feeling is very creamy in the mouth. The construction of the cigar is spot-on, the burn is even and sharp. The dark grey ash build up beautifully at the end of the cigar and holds on. Each puff releases generous clouds of thick yellow smoke. The second third starts with some leather, followed by some cedar. The earthiness makes a come back later on, which allows to cool down the palate. The flavors are well balanced and still very creamy. The draw remains amazing, the burn is effortless and the ash still holds on keeping the cigar cool without any need to relight. The final third is very smooth, while the flavor mix does not evolve too much, it is not detrimental to the enjoyment of the smoke thanks to the richness of flavor bouquet. Some sweet coffee also joins the mix. The finish is long, with some earthiness in the palate. 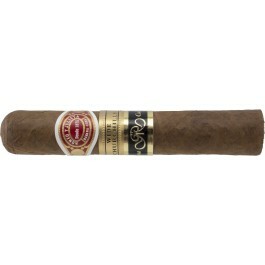 The ever holding ash is a testament of the great construction of the Romeo y Julieta Gran Reserva Cosecha 2009. It is a delight to smoke it until the fingers burn. Overall, the Wide Churchill Gran Reserva is a refined cigar that is ready to smoke out of the box and will please any aficionado.